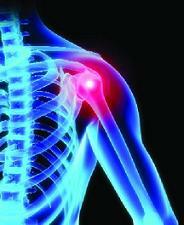 Shoulder Impingement is one of the most common ailments of the shoulder. For the most part, it is classified as a “syndrome”. By definition, a syndrome is a collection of symptoms that, collectively, characterize a given problem. In the case of shoulder impingement, there are several things going on at the same time, and each component can be of different severity. Symptoms can begin as a subtle ache or soreness in the front of the shoulder. It can worsen and progress into night pain as well. It can be quite uncomfortable attempting to sleep on the affected arm. Pain can be present with attempts to lift the arm, as well as other movements, such as reaching upward. 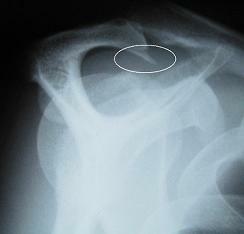 Shoulder impingement can be caused by repetitive overuse as well as injury. An example of overuse would be the assembly line worker who typically uses the arm for work duties at, or above shoulder height, and in a repetitive manner every day. An example of injury would be either direct trauma to the shoulder as in a fall or car accident, or a sudden jerking motion as in attempting to lift a stuck object. On the shoulder anatomy page, we discussed the bony structures that make up the “shoulder girdle”. The acromion, which is thought of as the “roof” of the shoulder joint can have its anatomy demonstrate various degrees of downward curvature, or down-sloping. This sloping is categorized in grades (I-III). Grade I has the least slope, while grade III has the most. Because of chronic inflammation that is typically present in cases of impingement, it is not uncommon for bone spurs, or “osteophytes”, form along the front portion of the under-surface of the acromion. The larger the spurs, the more irritation that can be caused upon the bursa sac (remember the anatomy page?). 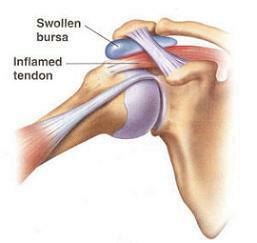 The bursa becomes thickened and enlarged from this inflammation. The more the spurs rub on the rotator cuff, the more inflamed it can become, hence rotator cuff tendonitis. If this situation continues unresolved, these spurs can wear the rotator cuff so thin, that a tear can, and often does, develop. A striking feature of this syndrome is that, in many cases, people complain of pain that radiates down the outside of the affected arm as far as the elbow. That is because the sub-acromial bursa sac can be very large, and frequently extends downward along the outside of the arm to just above the elbow. People are often surprised to learn their “arm pain” is really coming from their shoulder. So, in general, shoulder impingement is a syndrome that primarily consists of bone spurs of the acromion, sub-acromial (beneath the acromion) bursitis, and rotator cuff tendonitis, all of which can manifest itself as shoulder pain.